PT MRT Jakarta is about modifying a pedestrian bridge (JPO) on Jalan TB Simatupang, South Jakarta. It is part of Jakarta Phase I MRT development work.
" It can accommodate the target width per lane of MRT Jakarta, which is 3.5 meters"
PT MRT Jakarta Corporate Secretary Division Head, Tubagus Hikmatullah disclosed that his party will also modify another bridge that passes over the Jakarta Outer Ring Road KM 22+000. "It can accommodate the target width per lane of MRT Jakarta, which is 3.5 meters," he expressed, Wednesday (10/24). He explained that Jalan TB Simatupang width is only 4.3 meters. After MRT development, this road must be able to give space up to seven meters width or two lanes. By so, the road on the south will be closed from BPJS Ketenegakerjaan until PO Lorena Karina office. Then similar thing will also be done for Jakarta Outer Ring Road. The people can also use Jalan Lebak Bulus 1 as an alternative route to Lebak Bulus, Pondok Indah, or Ciputat area. He added that the new bridge design consists of a girder PC Concrete (T-Beam) with a span of 24 meters length and is above Jakarta Outer Ring Road with an additional three columns. 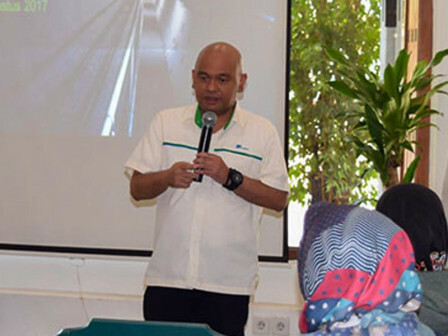 "Thereby the bridge trace will change into type L with structure of the bridge on the side of Jalan TB Simatupang will be made of steel," he stated.